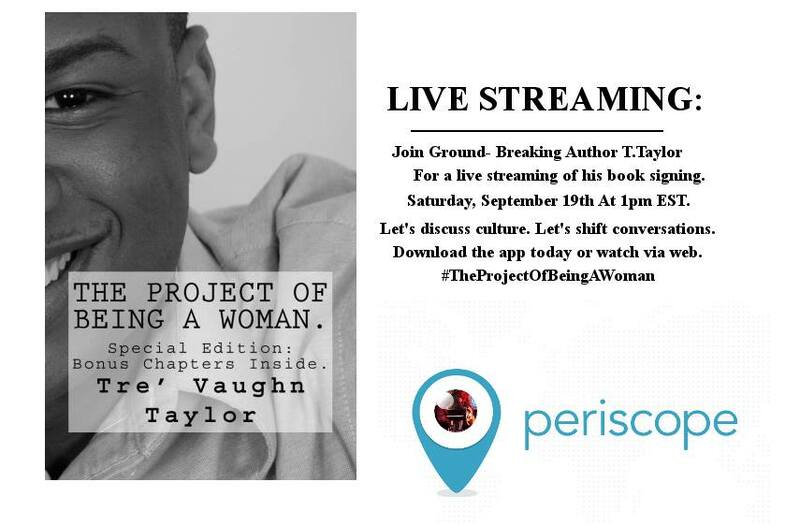 YOU CAN LIVE STREAM WITH TRE TAYLOR THE AUTHOR OF THE AMAZING AND FABULOUS BOOK THE PROJECT OF BEING A WOMEN ALONG WITH THE UPCOMING RELEASE OF HIS SOON NOVEL WHAT’S THE T .
YOU WILL NOT WANT TO MISS THIS. IF YOU CAN NOT BE THERE IN PERSON- THEN DO AS THE MOUSE – GET PERISCOPE AND BE THERE IN STREAMING!!! IT’S THE NEXT BEST THING TO BE LIVE !!! MAKE SURE YOU ADD HIS USER NAME TO YOUR PERISCOPE AND TUNE IN FOR HIM AS THE MOUSE WILL BE LISTENING TO HIS STREAMING . SEE YOU ALL THERE WITH TRE ON SATURDAY- SEPTEMBER 19TH @ 1PM EST!!! CATCH YOU THERE SAME MOUSE TIME —SAME MOUSE CHANNEL- WITH TRE!!!! ← PRICE DROPPED FOR SHATTER &SCARRED BY A J DOWNEY GET YOUR COPY NOW!! !